Hiko Seijuro writes a detailed tactical analysis about the UEFA Champions League match that ended Legia Warsaw 3-3 Real Madrid. Real Madrid travelled to Poland to face Legia Warsaw behind closed doors in their fourth round of matches in Group F. Real had thoroughly beaten the Polish club in the reverse fixture in which they ran out 5:1 winners, and they were looking to keep pace with group leaders Borrussia Dortmund. Zinedine Zidane made some enforced changes to his preferred starting eleven, with Fabio Coentrao in place of the injured Marcelo at left back and Nacho and Varane coming in at centre-back for the injured duo of Ramos and Pepe. Also, Kovacic started in midfield in place of his fellow Croat, Luka Modric. Legia Warsaw: (4-5-1) Malarz / Bereszynski – Pazdan – Rzeznickak – Hlousek / Odjidja – Radovic – Moulin – Guilherme – Kopczynski / Nikolic. Real Madrid: (4-4-2/4-2-4) Navas / Carvajal – Varane – Nacho – Coentra0 / Kovacic – Kroos / Bale – Ronaldo – Benzema – Morata. 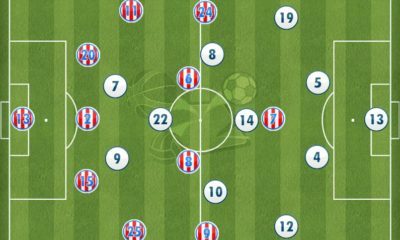 Zidane chose to use the opportunity to try out a new system and deviated from his preferred 4-3-3 formation. Real set up in an unfamiliar 4-2-4 shape, Kroos and Kovacic played as the two central midfielders, while Ronaldo and Bale who would have played as wide midfielders in a 4-4-2 pushed up to the front line and played as wide forwards. The lack of a third (attacking) midfielder meant that Real Madrid usually left the 10 space unoccupied; to counteract this, Benzema would make dropping movements into the space to try and draw out Legia Warsaw’s defenders and open up space in behind for a through ball; this was especially evident in the build up to their second goal, scored by Benzema himself. However, this didn’t happen often enough and so Real Madrid were forced to build their attacks from primarily wide positions, Madrid suffered a little from this in their game against Borrussia Dortmund when they played James Rodriguez who would move up into the same line as the forwards which created build up problems for Los Blancos though to a lesser degree because of James’ midfield instincts. In order to make use of Carvajal’s superior attacking abilities to those of Coentrao, Madrid primarily attacked from the right hand side, creating triangles with the ball near midfielder – usually Kovacic, Carvajal and Bale; in fact, all three of their goals were scored from the right hand side as they showed an overt desire to build from the right. Real Madrid also looked to make use of crosses from deep positions, from the fullbacks as they sought to capitalize on their increased presence and the aerial ability of their forwards which was highlighted all match long during set pieces. Bale’s goal came from one such cross and he lashed home a Ronaldo flick on from a deep Fabio Coentrao cross. It is usually ideal to build attacks from the centre or the half-spaces but Real Madrid were still able to build good attacks and create good goal scoring chances due to the qualitative superiority of Carvajal and Bale. 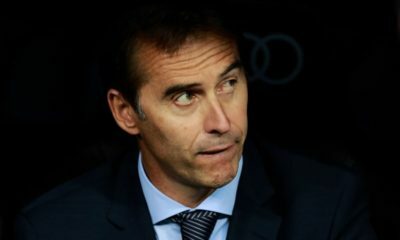 Real Madrid set up in their 4-2-4 shape not only while attacking but also while defending and this affected them adversely in a number of ways. First, the fact that there was very little staggering in the positioning of the forwards, with all four of them being more or less on the same horizontal line created a large disconnect between them and the midfield duo of Kovacic and Kroos who had to decide whether to step up and open up space in behind or stay in front of the back four and concede space in front of them. Despite the fact that the Legia players are not the most adept at playing out of the back, they were still able to bypass Real Madrid’s press due to the passive nature of Madrid’s pressing and the large gaps between Madrid’s forward line and their midfield. Ronaldo was especially guilty in this regard as his lack of defensive work rate allowed Legia Warsaw to build up through the right flank and make use of Guilherme’s ability on the ball to threaten the Madrid backline. Legia bypassed Real Madrid’s press primarily through two means: horizontal circulation and simple vertical line splitting passes. They would usually make a simple pass to a player positioned behind Real Madrid first line into the midfield line where they usually had a 3 vs 2 advantage over the Real Madrid midfielders. 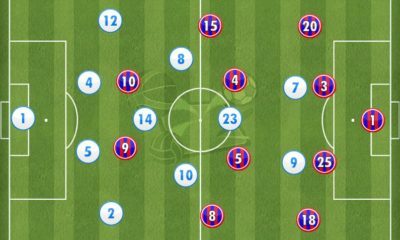 Due to the absence of Casemiro and a third midfielder, and also due to the fact that neither Toni Kroos nor Matteo Kovacic are defensive midfielders, Madrid usually left the ominous zone 14 unoccupied, and woe betide any team that does that. Legia Warsaw coach J. Magiera noticed this and decided to attack this space. His team went about this in several ways. First, they sought to gain access to zone 14 from wide positions. Due to the lack of defensive cover from the Real Madrid wide forwards, especially Cristiano Ronaldo on the right hand side, Legia sought to create 1 vs 1’s with Guilherme facing off against Fabio Coentrao in order to make use of his qualitative superiority over the Madrid left back. To deal with this, the ball near central midfielder, either Kovacic or Kroos would shift over to support Coentrao and double up on Guilhereme in an attempt to reduce his impact; Guilherme would either dribble out of the situation himself or combine with the ball near central midfielder and right back and from there Legia would be able to access the centre of the pitch and attack zone 14. Their first goal was scored in this manner, as Ojidja was able to dribble in from the right half-space to shoot from an unoccupied zone 14 with Kovacic merely a spectator. Guilherme splits the two Madrid players with a simple pass and Ojidja scores from zone 14 with Kovacic just arriving. 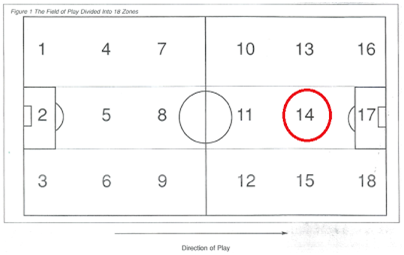 The second way, they accessed zone 14 was through long escape passes to their centre forward. Earlier in the game, Real Madrid’s central midfield pairing were reluctant to step up and press to deep inside Legia’s half; however, after Legia equalized and Madrid started pushing for a winner, they sought to win the ball in more advanced positions and the midfielders would often step up to press leaving zone 14 exposed. To exploit this, Legia would play a simple lofted pass into the centre forward who would execute a lay off pass to the on rushing midfielder. Their third goal was scored exactly in this fashion; a long ball was played towards substitute Prijovic who used his superior strength to hold off Nacho and execute a lay off pass for the oncoming Moulin to finish from just outside the box; the exact position a defensive midfielder is supposed to protect. After Legia equalized, Zidane brought on Lucas Vasquez for Benzema but the substitution failed to bring any change as it was not accompanied by a change in system. Ronaldo simply moved centrally permanently alongside Morata, Bale moved out to the left and Lucas took up position on the right flank as Madrid looked more and more to crossing. However, their issues in midfield remained unsolved and Legia deservedly took the lead even though they couldn’t hold on to it. The result leaves Madrid two points behind group leaders Borrussia Dortmund who claimed a 1:0 victory over Sporting Lisbon in the other Group F game. Zidane will be disappointed not just with the result but also with the performance; however, he got his tactics wrong and his lack of tactical flexibility ultimately proved decisive. On his part, Magiera will be delighted with the performance if not the result despite the fact that they can no longer progress from the group stages. They still harbor hopes of Europa League qualification, and if they keep putting out performances like this, they may well make it.